Many people who own Nikon 1 camera gear have an interest in close up photography. Unfortunately at the time of writing of this article there was no 1 Nikon macro lens available. 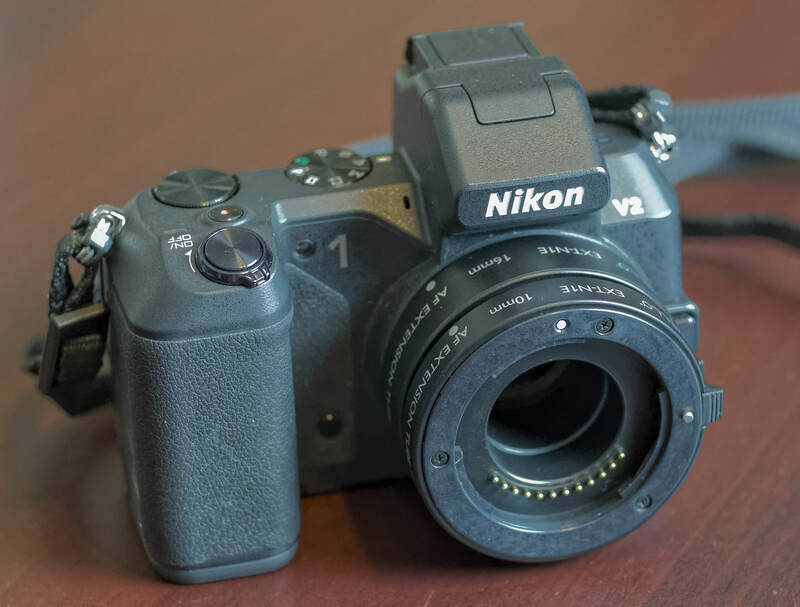 Photographers can use their DX or FX Nikkor macro lenses on their Nikon 1 bodies by using an FT-1 adapter. I’ve done this in the past with my Nikkor 105mm Micro f/2.8 and found that the resulting set-up felt unbalanced as the lens dwarfed my V2 body. The autofocus on my macro lens tended to hunt quite a bit when used with the FT-1 I for close up work. As a result I typically used it on a tripod and manually focused the lens. The Vello Nikon 1 extension tube set includes two extension tubes, one 10mm and one 16mm. They can be used independently or joined together for maximum effect. Extension tubes place distance between your camera body and lens. This reduces the minimum focus distance of the lens and allows subjects to fill more of your frame. Extension tubes are hollow and do not contain any glass elements so they do not degrade the optical performance of any lenses that you use with them. NOTE TO READERS: Since writing this review I have experienced problems with the flanges on these extension tubes cracking and breaking. My original set of extension tubes were replaced and after only using the new tubes a couple of times I’ve noticed that they are experiencing the same quality issues. Under these circumstances I can no longer recommend that readers purchase these particular tubes – Thomas Stirr. I would recommend storing the extension tubes stacked together and packed in bubble wrap or in some kind of other protection to reduce the likelihood of damage to the electrical connections. Or, simply buy a 1 Nikon camera body cap and a lens end cap. The body cap does fit a bit loose so I’d still recommend having some additional protection on these extension tubes. The Vello Nikon 1 set of extension tubes are fully automatic and allow your Nikon 1 body to continue to auto-focus and auto expose. Using extension tubes does reduce the amount of light coming through to a camera’s sensor and it can affect auto-focus performance. I found no discernable difference in auto focus performance with my Nikon 1 V2. It was still very fast and accurate and I really enjoyed using these extension tubes. 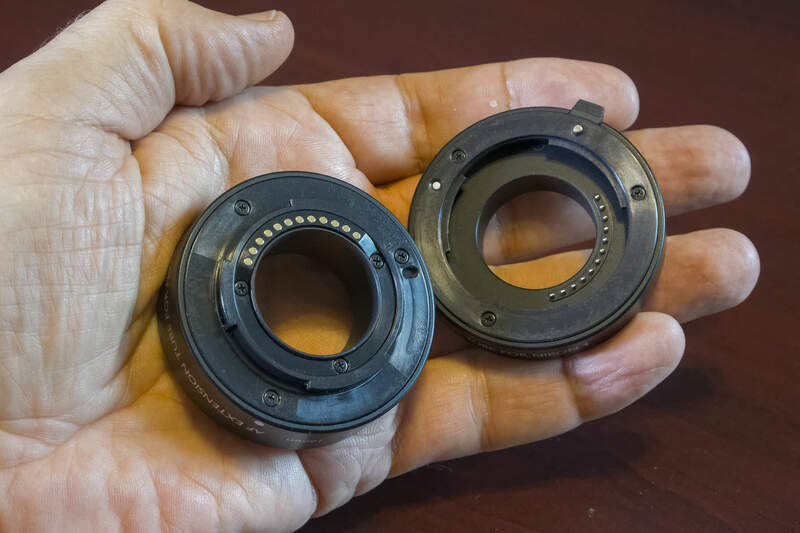 John Bosley wrote a great review on the Vello F-Mount extension tubes for F-Mount Nikkor lenses. In his review John did a series of images showing the impact of various extension tubes as well as what happens when tubes are stacked. 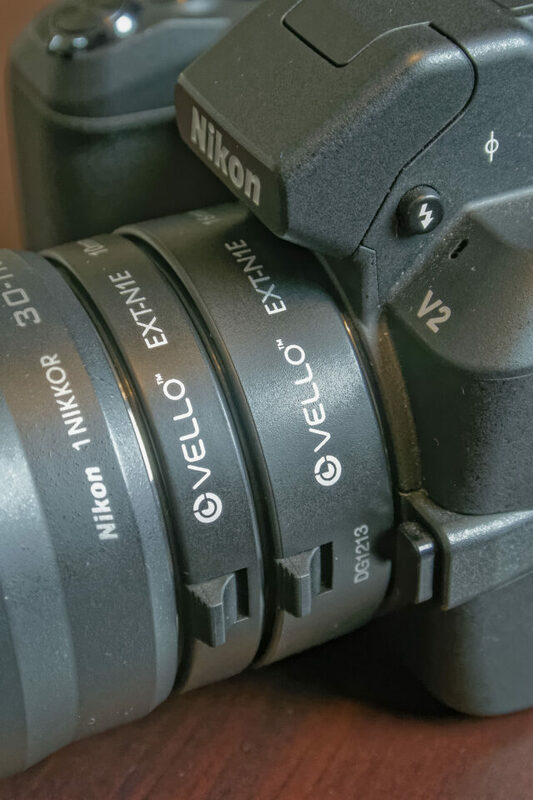 Rather than duplicate the demonstration that John has already done, I decided to focus on some real-life examples for this review to give readers a good idea of what kinds of images can be captured when using these Vello extension tubes on their Nikon 1 cameras. For all of the images in this article I used both tubes stacked together and mounted with the 1 Nikon 30-110mm f/3.8-5.6 zoom lens and Nikon 1 V2. I thought this was a pragmatic set-up for this review since the 30-110mm is a very affordable lens that many owners of Nikon 1 cameras have in their bags. 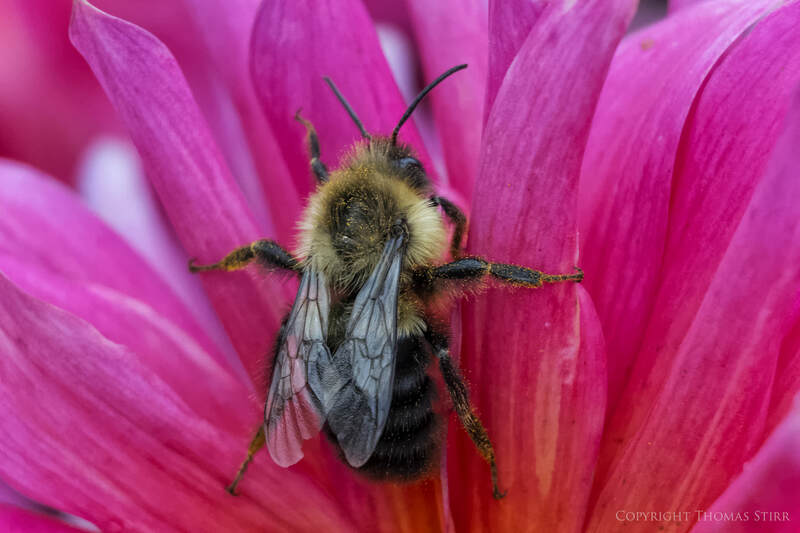 This set-up also allowed me to capture images from a distance of approximately 12-15 inches (30.5 to 38 cm) from the front of my lens to the subject, which in the case of live bees is a prudent distance. As Photography Life readers will know from many of my previous articles about using Nikon 1 gear I like to push my V2 to see what it can do. I carried on this tradition with my test subjects for this review. 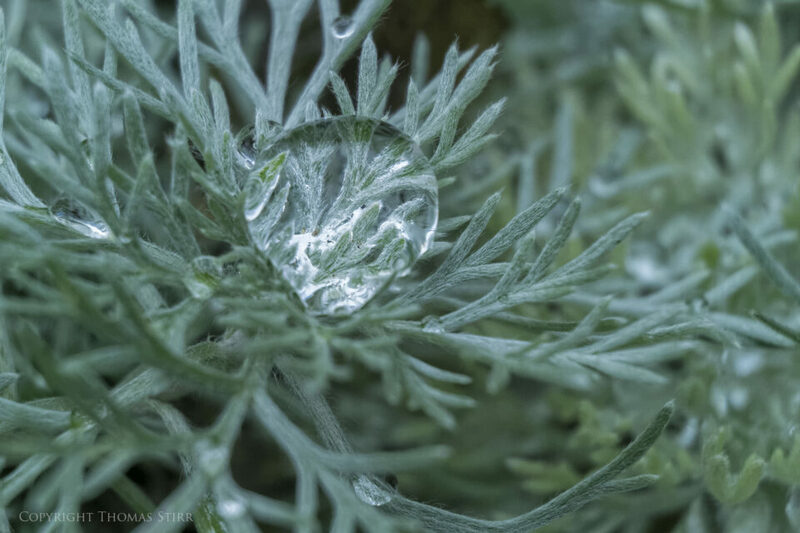 I shot hand-held under very dull, overcast conditions with some light misty rain falling at times. If you look at the details under each image you’ll notice that I used a minimum of ISO-800. Most of the images in the article and accompanying YouTube video were taken ISO-1600 and as high as ISO-3200. I shot primarily at f/5.6 but did the occasional image at f/8 to see the impact on depth-of-field. 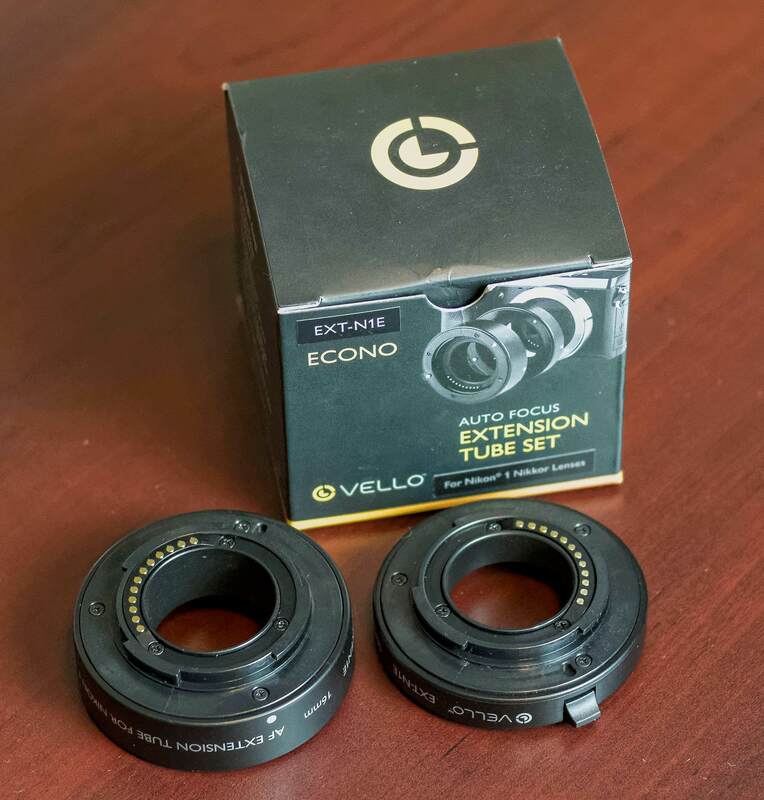 I had a blast shooting with these Vello extension tubes! They are so lightweight, easy to use, and affordable that they really are a ‘no-brainer’ purchase for any owner of a Nikon 1 camera that is interested in close up photography, especially if you already own the 1 Nikon 30-110 f/3.5-5.6 zoom lens. I plan on having these Vello extension tubes with me whenever I’m shooting with my Nikon 1 V2. Wonderful photos made with such a small camera! Great. Do you know if there are significant differences between the Nikon J1, J2, J3, and J4? I’m thinking about getting a used one and am wondering if there are significant advantages to one over another. Any opinions yu have will be most appreciated. Thanks. Thanks for your comment…I’m glad you enjoyed the images! I had a blast taking them! Each generation of Nikon 1 camera has some improvements and there are also differences between the various models. The sensors used in Nikon 1 cameras have increased their pixel count substantially since the line-up was first introduced. 10MP to 14MP…then to 18MP. The actual performance of the sensors in terms of dynamic range, colour depth and low light performance really hasn’t changed much at all. While this may sound bad on the surface it is actually good given the huge increase in pixels. Personally I would only choose a Nikon 1 V series camera as I like to compose my images through a viewfinder. I find it much more accurate and it also allows me far better handholding technique. I bought a J1 two lens kit and my wife was using the J1 during a recent trip to Greece. She struggled quite a bit trying to frame shots in bright sunlight and it was a bit frustrating for her. I found a good used V2 and bought that as a third video camera for our business (I shoot with a D800 and two V2s). I sold the J1 and she uses the second V2 when I’m not out on client work and she likes it MUCH better than the J1 as it has a nice deep grip and the built in viewfinder. It really depends if you are comfortable composing off the rear screen only. If you are then a J series camera should do the job for you. You’ll need to think about how you’ll use the images. If they’re only for Facebook etc. then it won’t make much difference. If you are planning to do any print enlargements then I would go with a 14MP or 18MP body. Tom, thanks so much for the information. I haven’t held either the J or V version so I was unaware of the lack of viewfinder. The viewfinder is important to me as well having just recently switched from 35mm to digital. By the way, I didn’t assume you were a shill for Nikon! I just thought you were a good guy sharing some of your knowledge with the rest of us. Thanks again and keep up the good work. Since you’re like me and like to compose using a viewfinder then the V series in the Nikon 1 line is your only choice as the S and J series do not have viewfinders. You should likely avoid a used V1 as too many of the controls are buried in the menu. As a DSLR shooter you may find this frustrating. I’ve found that the V2 is close to shooting with a DSLR. Shutter speed and aperture can be adjusted with external body controls. I use the “F” button on the back of the camera to access standard settings rather than having to go into the menu and scroll through it. This allows me to change ISO, focus settings etc. very quickly. :-) You’re absolutely right by the way…I am a good guy….although perhaps a bit off centre! Great article, thank you for sharing. The photos of the tubes on the camera with lens are helpful to understand the impact on handling. I like taking and viewing these kind of photos and enjoyed looking through your shots – very nice! I know what you mean about the 1 series not being a tripod camera. I tend to think if I’m going to use a tripod I may as well use my DSLR. It seems this set up works very well for this kind of photography though. That is a big plus, as these kind of shots are fun and easy to access. I have never used extension tubes and these ones really appeal, because they are small, light cheap and complement the 1 series lenses well. What are the trade offs for using these tubes? I think I have read that you loose light – is that correct? What kind of magnification do they give vs just the 30-110 alone? Do they require higher shutter speeds to combat increased camera shake potential, or does the VR remain effective? Thanks for your positive comment…and all of your questions! I had to go out in the backyard this morning and do a few test shots in order to answer some of them. I’ll try and answer your questions in order. Once you mount extension tubes on your camera body you lose the ability to focus at infinity so you’re committed to doing close up work with your camera. If another type of image opportunity happens by, you’re likely to miss it. There is some loss of light and the amount of loss will depend on how much extension you are using at the time. Some cameras will lose focusing speed as a result of the light loss. I didn’t notice anything with my V2 but John Bosley did when he did his review of extension tubes for F-mount Nikon lenses. I went in the backyard this morning and took some ‘non-scientific’ shots so I could compare images with/without extension tubes. For the first image I got in as close as I could to still have the 30-110 lens auto-focus. I shot at ISO-3200, f/5.6 in aperture priority. This resulted in a shutter speed of 1/320. When I put the image up on one of my 27″ monitors I measured the width of the raspberry and found it was 7cm. I then put the two extension tubes on and re-shot the same raspberry, again moving in as close as I could to still have autofocus operate. At the same ISO and aperture the second shot resulted in a shutter speed of 1/80. So there is a two stop loss of light when using these particular extension tubes with the V2 and the 30-110 lens. 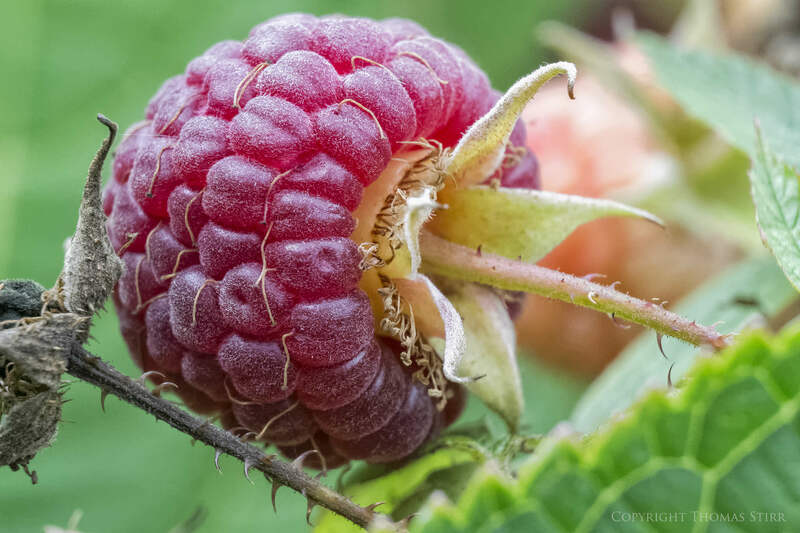 I measured the raspberry in the second image and it was 29 cm in width so the difference in the image widths was about 414%. I did not find any difference in the VR performance of the 30-110 lens. I had no problem getting a nice, sharp image at 1/80. Keep in mind that technique does come into play when shooting hand-held at slower shutter speeds. I’ve been able to get good usable shots with the 30-110 at very slow shutter speeds so my experience with that lens may not be representative of what other folks can do with it. The VR on the 30-110 is quite good and the small size/weight of the Nikon 1 system in general does help with results obtained at slower hand-held shutter speeds. Yes, high ISO performance of the Nikon 1 cameras is not great. DxOMark rates them at about ISO-400. Prior to getting OpticsPro 9 I tried to keep my maximum ISO at 800 when shooting with the V2, and perhaps ISO-1600 in a pinch. Using the PRIME noise reduction function makes a big difference to my eye and I now have no hesitation to shoot at ISO-1600 and even ISO-3200. My ‘in-a-pinch’ ISO is now 6400. Keep in mind that I do not do any still photography for clients with the V2…shots I take with it are for my own use and some images may find their way on to my web site as a gallery print with a maximum print size of 12×18. 5) Will I be doing a noise reduction article in the future and compare the PRIME function in OpticsPro 9 with other software? The short answer is no. Someone like Nasim would have the technical expertise to be able to write an article of this type. This is not my forte at all. I would be the first person to admit that I am not a technically-oriented photographer…my approach is far more hands-on and experiential. Wow what a comprehensive answer! Thank you very much for taking the time to experiment and reply. Your answers are very helpful. The tubes seem to be a great addition, as that is a lot of extra magnification. Keeping VR working is a real bonus for handheld shots too. Your description of how you can use higher ISO with DXO is also very helpful. Up to two stops benefit for your use is really quite substantial. Coupled with the increased depth of field of the 1 series and the macro shooting envelope is increased further. Thanks again for the detailed additional testing and reply, very much appreciated. Not a problem! You asked some very good questions that deserved some time to answer. 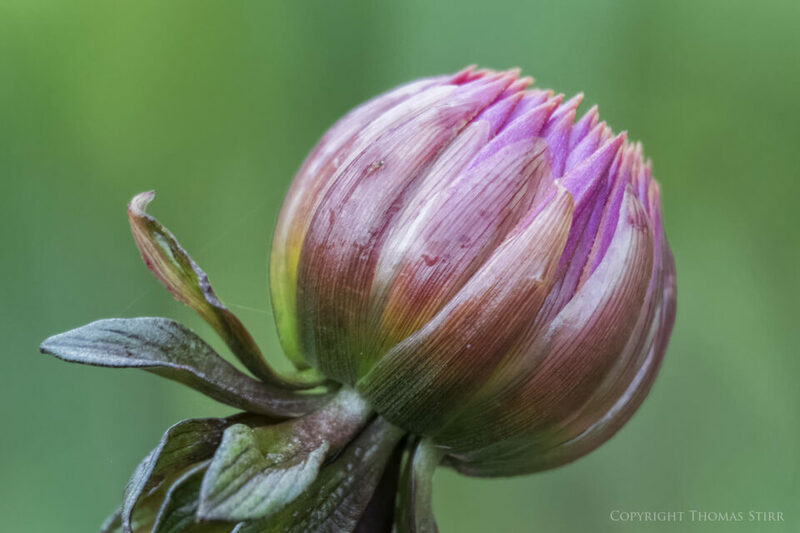 I hadn’t tried to estimate the impact of the Vello extension tubes on image size so I was intrigued to find out as well so the test shots this morning were beneficial in terms of my education. As far as DxO OpticsPro 9 and its PRIME noise reduction function goes…please keep in mind that what may be deemed acceptable to one individual could be different for another. I had some discussions with a couple of other photographers who use this program (which is one of the reasons I bought it rather than sticking with OpticsPro 8) who told me they thought it gave them about 2 stops more latitude when shooting with their DX gear. I was sent some ‘before and after’ samples which impressed me so I thought I’d take a chance. I didn’t know what to expect with the Nikon 1 V2’s small CX sensor but I’m glad I gave it a try. There’s no doubt in my mind that this set-up (V2, Vello tubes, 30-110 zoom) allowed me to capture some images that I simply could not have taken with my D800 and 105mm Micro f/2.8. That set-up would have been too bulky and heavy to get into some of the tight spots I could reach with my Nikon 1 V2 set-up. The additional weight would also have made hand-holding much more difficult. It appears that this setup gives a wonderful depth of field compared to a DSLR. Is this just my imagination? Yes, the depth of field when using the Nikon 1 system is greater than a DX or FX setup. The size of the sensor in the Nikon 1 series creates a 2.7x crop factor when compared to a full frame camera. The Nikon 1 system uses much wider lenses to achieve an equivalent field of view as a full frame camera. For example, the 1 Nikon 32mm f/1.2 lens has an equivalent field of view of 86mm but will deliver much greater depth-of-field because when you use it you are shooting with a 32mm lens. If you look at my recent Images of Greece article you’ll notice that the landscape shots have great depth of field even though they were shot at f/5.6. Thank you for another interesting review. There is another option, which those less keen on adding layers between the lens and body, and others, may find simpler – use a Nikon N1-CL1 MC close-up lens. The catch with this is that it will only screw on to the filter thread of 40.5mm. That said, this is a common used filter thread size for Nikon 1 series lenses. It will of course not entail having to take the lens off, and that may be both faster and more efficient for some users. Haven’t bought or tried one myself, but I thought it should really be mentioned here! Thanks for your posting and the suggestion about using the Nikon M1-CL1 MC. It reminds us that there are always different ways to get the effect we seek as photographers. I’ve never used the M1-CL1 MC so I can’t comment on it specifically. I have tried the Nikon N1-CL1 MC close-up lens with both the 10-30 and 30-110 as well as with the 18.5 mm. I found it relatively disappointing as I only felt around 1.5 times magnification, if that. IQ was not significantly degraded. I have also tried the Hoya Close-up No.3 lens which is, I believe, a much better solution – unfortunately they do not make a 40.5 mm ring version. I have it in 55 mm and have used it on the 10-100 and could say that it works well. Hoya also make a series of Achromatic lenses called ‘macro’ which give +10 diopters. I am planning to get hold of the 52 mm version soon to try out on the excellent 32mm N1 lens. I need to experiment first, however as the focusing distance will reduce to around 100 mm (4 inches) and this may be a problem as Tom has highlighted. 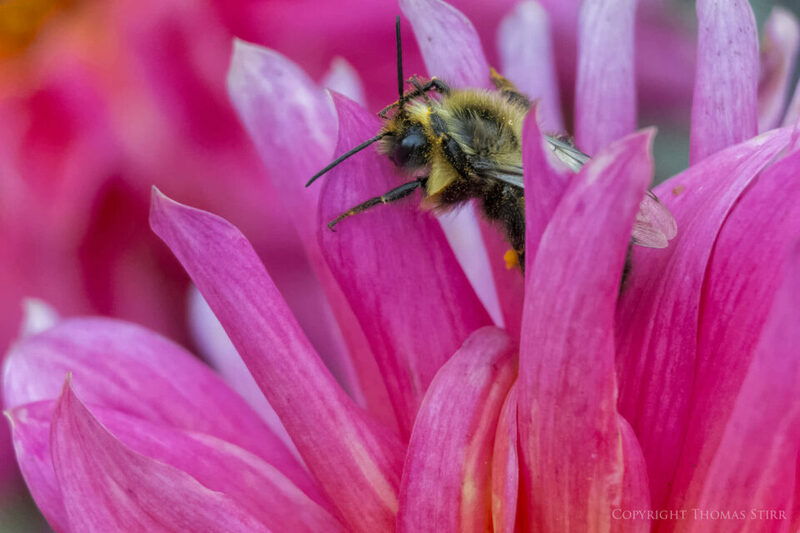 How do the extension tubes compare to ‘close-up’ lenses? According to the equation I have, the new focal length is found from F’ = 1/(F + D) where F is the focus distance of the lens and D is the number of diopters of the close up lens. Thus for the 10-100 at 100 mm the focus distance is 0.65m and with a +3 close-up lens the formula predicts a new focus distance of 1/(0.65+3) =0.27m which is about what I find. This suggests to me that the image size is increased by 0.65/0.27=2.4 times. Similarly with a +10 dipoter close-up you would get about 7 times – close to your extension rings. I am not sure if my understanding is correct, however. It would be wonderful if you could get hold of a +10 dioptre close-up to compare with your Velo kit. I love the convenience of a high quality close-up lens so am interested to know if there is a trade off against the extension rings. Thanks once again for your informative articles. . . and I still have my fingers crossed that you get hold of a V3 + 70-300 for testing soon!! You are obviously much more technically oriented than I am! As far as close-up work when using the Nikon 1 camera line…I think that the Vello extension tubes will meet my needs. I am expecting to receive my 1 Nikon 70-300 within the next couple of weeks and I will definitely be testing that lens out with the extension tubes. I expect that it will generate images that will be about 75% larger on the CX sensor than what is possible with the 30-110 [(3.3 ft/5.2 ft) x (810mm/297mm)]. Given how sharp I have heard that the 70-300 lens is…this should be awesome. I like using extension tubes since they do not contain any glass elements and don’t directly impact image quality. Obviously loss of light means shooting at slower shutter speeds and/or higher ISO which can have an effect in terms of camera shake or loss of dynamic range. Plus, using extension tubes is faster than having to change filters on a lens. A number of years ago I had a close-up lens for a Panasonic camera and I didn’t really enjoy using it very much. I found that I had to get far too close to subjects in order to use it. I like to shoot macro-type images from 12-18 inches away (30.5-45.7cm) as it gives me much better framing potential. Also safer when photographing bees, wasps and such. Thanks for this Tom. I think I should invest in these extension tubes as well ! If they work as well as you described they do have the convenience of working on all lenses – whereas the macro lenses are size dependant. Did you research which manufactures make them for Nikon 1 system before you decided upon the Velo system? Looking forward to your views on the 70-300 ! I just love it – only problem I found with it is that at 70 mm it is too long to leave on the camera when walking around. I found myself continually changing between the 10-100 and the 70-300 in these circumstances. 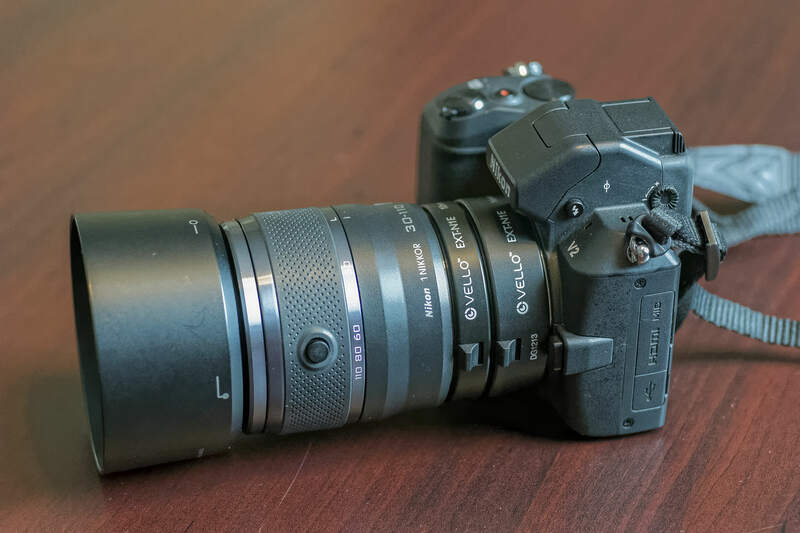 Actually I read John Bosley’s review on the F-Mount Vello extension tubes and I was intrigued to find out if something like that even existed for the Nikon 1 system. A little while later I was on the B&H site buying a few filters and stumbled on these Vello tubes for the Nikon 1 system and thought I’d give them a try. I have no idea if there are other manufacturers out there or not. My 10-100 PD zoom is also quite a bit heavier than a typical 1 Nikon lens. I think it is about the same weight as the 70-300. Since I now have two V2 bodies my plan for my next trip is to mount the 10-100 PD zoom on one body and the 70-300 on the other so I won’t have to worry about changing lenses, other than when I need to take a shot with my 6.7-13mm. Since last talking to you I have bought a couple of Hoya’s Close-up No.3 Achromatic lenses and had great success. The tubes are on back order at BandH unfortunately. Thanks for the additional insights! I will definitely check this out. Not sure if you have seen my latest article that shows some bird images taken with the 1 Nikon 70-300. I’m working on a hands-on review of that lens and hope to have it finished by mid-November. Yes I have looked at your recent preview article for the 70-300. Very impressive Tom. You inspire us all as to just what can be achieved with this ‘little’ camera. I look forward with eager anticipation to your full review later this month. I am, as you know, completely sold on the N1 system. It suits my type of photography spot on. Your articles on how to maximise its capabilities by understanding its limitations are exactly what is needed to raise its profile and also, in my case, to help me raise my ability from behind the lens. Browsing another web site a few days ago where a poster was posing the question ‘where goes the camera market now’, I spotted a response which said in effect ‘ if Nikon can just raise the ISO ability of their 1 system then it exactly fills the need of many photographers who want better than an iphone but do not want the size and weight of the DX FX systems’. Sort of sums up my own feelings. Poor high ISO performance is the only drawback feature I still notice viewing, as I do, most of my photos on a retina screen iPad. Good luck with your review Thomas and keep your great articles coming. I praise Nasem for bringing you onboard! You have gone to extreme length to familiarise the audience with Nikon V1 system….Nikon should be very proud for having people like you behind their soon to be a failed concept. I just hope your hard work will force Nikon not to abandon the concept few years down the line. You have done your best to make your V1 images look acceptable but truth be told IQ is well below par. IQ is a function of both camera and lens and there is no way that the IQ from a Nikon 1 is going to equal what can be obtained by cameras with larger sensors like my D800. Any of the still photographs that I do for clients are all done with my D800 and my selection of FX lenses so your point about IQ is well taken. Having said that, many people who have never even held a Nikon 1 let alone shot with one, dismiss it out of hand just because of sensor size. More often than not when I reach for a camera to shoot some personal images or just to go out and have some fun with, it is my Nikon 1 V2. It is simply a fun system to use and the more I use it the more I like it. As a matter of clarification, I don’t have any kind of official relationship with Nikon. Heck…I’ve been trying for months now and I can’t even get Nikon Canada to loan me a ‘review sample’ of the Nikon 1 V3 so I can do a review of that model for Photography Life.I shoot with the Nikon 1 V2 because I own two of them for my business where they do a great job to compliment my D800 for client video production. In terms of the future of the Nikon 1 product line I think Nikon needs to address dynamic range and colour depth with future development. Lens quality has been increasing over time. For example the 32mm f/1.2 is a wonderful lens with Nano crystal coating and excellent sharpness. My sense is that Nikon would not be investing R&D dollars into that kind of lens if they had any immediate plans to kill the product line. In the longer term…who knows? Only recently (yesterday!) found your web site – now bookmarked. These images are absolutely stunning (like all your work). It doesn’t affect how I regard these latest images … but were the insects alive, and even not frozen? Not only can I not achieve anything like your IQ with my equipment (after over 60 years of serious photography), but I can never find insects that will pose for me this way!! 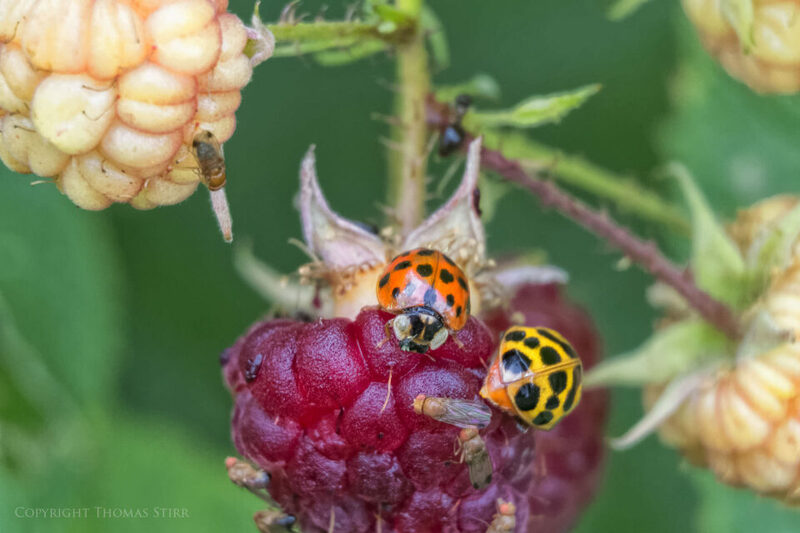 If your insects were processed, please understand I’m not complaining – just brilliant photos! All of the insects in the photos were indeed alive and moving. Some, like the large bees were certainly a bit sluggish, but the smaller ones (images 1, 10, 13 and 19) were very active and flitting around fairly rapidly. 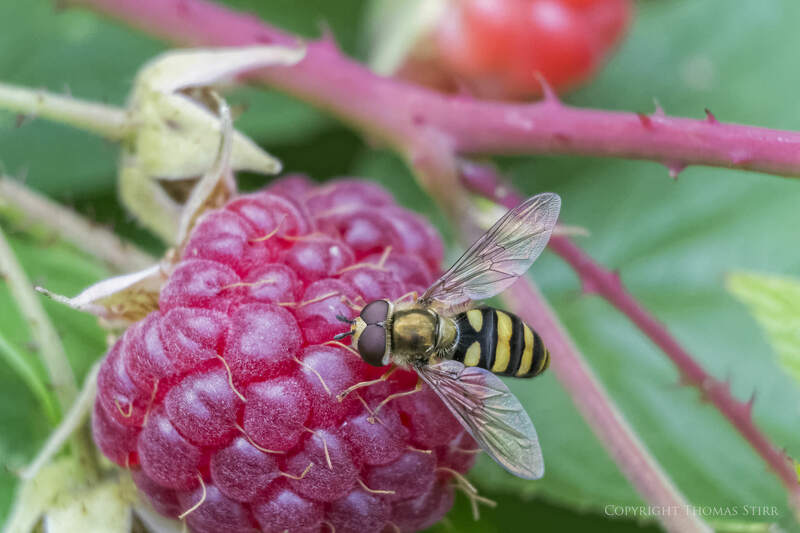 I’m not an expert in such things…but when I looked at the images again this morning I noticed that the smaller ones do not have pollen on them so they were more than likely wasps feeding on the raspberries. One of the reasons that I ended up shooting at high ISOs in many of my shots was to be able to use a high enough shutter speed to avoid getting blurred images due to movement of the subject insects. For many of the shots I only had a second or two once the insect landed to get my shot. That’s why I used single point auto focus so I could get my shot framed up as quickly as possible. One of the strengths of the Nikon 1 cameras is their ability to focus very quickly and very accurately. This was another factor in me being able to get these shots of moving insects at such close range. plant on which they will pose!! good as it used to be, so maybe yours will be first soon!!). Thanks again for both the brilliant web site, and for the reply. Fortunately (or unfortunately) we have about 25 feet of ever-bearing raspberries bushes in our backyard. The past two seasons they have been ravaged by some sort of worm infestation which we’ve not been able to get under control. As a result we have a large number of bees, wasps and other critters around the bushes most of the time since we don’t bother picking the berries. 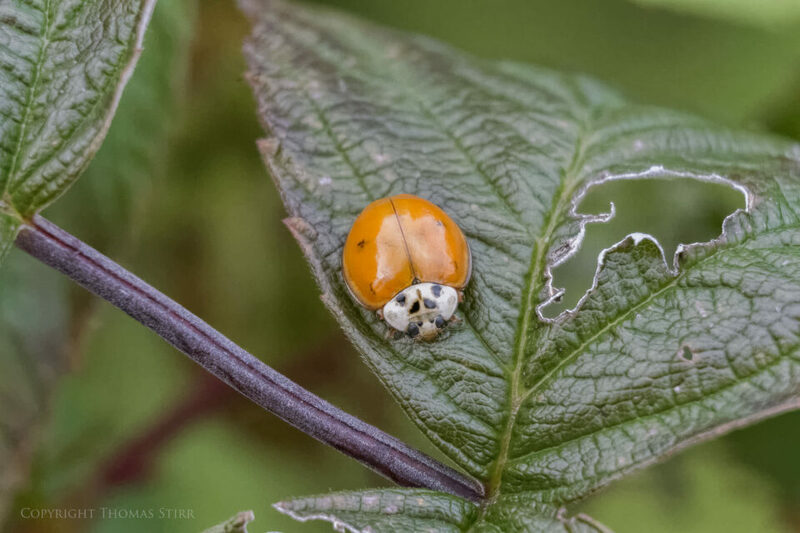 To put the sample images together for this review I only needed to spend a couple of hours in my backyard to capture more than 300 hundred images…so willing subjects and plants on which they could pose for me was not an issue at all! Its interesting that you like the Nikon 1 files more than the ones from your Olympus OMD. I’m just starting to play with my 1 Nikon 32mm f/1.2 and I am quite enjoying it. I understand what you mean about ‘getting attached’ to the camera. The more I shoot with it the more I like it. Loved your comment about the Nikon 1…”can zoom almost as far as no man has gone before”. In this article I love the pictures and your taking the time to answer users. Now to a couple points. I am getting very tired of comments like James’ re smaller sensor cameras. I recently purchased a new Olympus OMD system including a total of 3 cameras. (Two OMD-M1’s and an M10 a bunch of lenses, flashes etc. I did keep my Nikon system and still use it, especially for wildlife.) Now obviously these cameras have a larger sensor than the Nikon 1, but many of the same uninformed biases apply re “IQ”. I can sum it what.I found in one simple sentence. The “IQ” is the photographer. I promise a good photographer can take compelling images with small sensor cameras. Your current article / images proves that convincingly. Clearly the Nikon 1 system does some cool stuff with fast AF, high frame rates and good video. Whether or not this system is commercially relevant is immaterial to your use . I wish everyone would give these type of discussions a rest, as they add very little. Thanks very much for your positive words, they are most appreciated! I found it interesting that you have also made some investments in a smaller format line of cameras…a quite significant investment based on the details that you have shared with your posting. I think each of us assesses our photographic needs and buys the best gear we can to meet those needs. The sensor size/IQ debate will go on for many years to come. From a purely technical aspect there is rationale for the argument that larger format sensors have the capability to produce better images in terms of dynamic range, colour depth and low light performance. There also is rationale for your point of view that any system of cameras and lens is a tool that a photographer uses to achieve their vision with their images, and that the skill of the photographer can be demonstrated regardless of the tools chosen. I think there is also another element that comes into play in terms of IQ, and that is software. Not only have cameras and lenses been making huge technical advances, but so too has software. In many ways advances in software is becoming a great equalizer between camera formats. While individuals may assess the IQ of my images in this article differently, my personal assessment is that the images taken (especially those at ISO-1600 and ISO-3200) are good, solid images. I will be doing some print tests this week with some of them. I expect them to reproduce very well and thus become gallery prints available for purchase on my web site. So in my mind the Nikon 1 system is commercially relevant. Rather than get hung up over the technical aspects of cameras and lenses I think the joy and the challenge of being a photographer is for all of us to go out and shoot images in alignment with our vision, to push our creativity, and heck….just have some fun. It became obvious to me that I could get professional results with these cameras. Are there some limitations. .. well of course there are! FF sensors gather more light and clearly make it easier to capture images in low light. The full frame Nikons have better phase detection AF making it easier to capture moving subjects. Despite this I manage to get images of rambunctious dogs that I will happily present to customers. I deal with the limitations (few) and my back is happier carrying less weght. I think you make a great point about software being able to clean up some of the shortcomings introduced by small sensors. I haven’t done it yet , but I will eventually evaluate the DxO software. I really relate to your comment about ‘good enough’. My gallery prints are usually a maximum of 12×18 and any of the images that I take for my various posters are all slightly smaller than that so I don’t ‘need’ a camera that can produce files that can be blown up to 40×60. I’m looking forward to the weekend when I’ll be doing some enlargements from my Nikon 1 files…I suspect they will be more than ‘good enough’! Shooting with smaller, lighter gear is quite liberating and like your’s, my back thanks me! I’m interested in the V2 as well, but it seems the viewfinder is not as good? I tried it out and indeed noticed a difference. For macro I allways use the Raynox lenses. Just yesterday I filmed the same insects you shot here, in macro for the first time. Didn’t turn out too bad for a first attempt. You do have to get really close with the Raynox though, is this any different with the Vello tubes? Thanks for your positive comment…I’m glad you found the review of interest. With the Vello extension tubes and the 1 Nikon 30-110 zoom lens I was shooting from about 12-15 inches (30-38 cm) away. Thanks for identifying the insects as blossom flies…I had no idea what they were. As far as the viewfinder with the V2 goes…I’ve never shot with the V1 so I cannot make any first hand comparison. 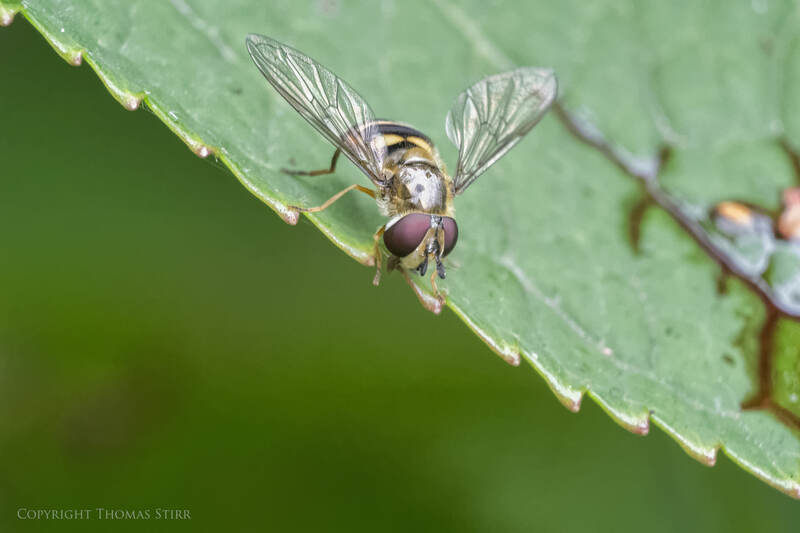 That’s a bit further shooting distance than the Raynox lenses… might by handy, although I quite like to stick my nose in things;-) The flies are hoverflies in English I just learned from Google. And btw, these are not wasps, they are blossom flies. First of all, thanks for the great review of this product… and informing me that such a thing even exists for the 1 system! I, like you, use my V2 is my “fun” camera and grab it for doing things like cityscapes and landscapes. I’m still building the system up myself but I certainly want to get the 70-300mm for the 1 system to have it a wildlife / birding system and I will surely be picking up these extension tubes to add macro to the mix. 1) How much magnification can you get with the standard 10-30mm kit lens? As of now I’ve been using my V2 mostly for wide shots with the 6.7-13mm during photo walks so I don’t have the 30-110mm unfortunately. 2) Can you use the extension tubes + FT-1? I’d like to play around with that if possible to see how close I can get with a 50mm f/1.8G. Either way, you’ve already 90% convinced me to get these. I hope Nikon brings out a Micro lens for the 1 system that we can combine with these to exceed 1:1 magnification! Thanks for your comment and positive words! Like Tom D. you asked some questions to which I did not have immediate answers so I needed to do a few test shots this morning for you. As far as using the 10-30mm goes…this can be done but to achieve maximum effect the front of your lens will be about 1″ (2.5 cm) from you subject. This makes this set up only good for static subjects…some things like spiders in a web may be possible I suppose. Based on my crude measurements the size of the subject increased from 2.2 cm to 14.7 cm, or about 660%. 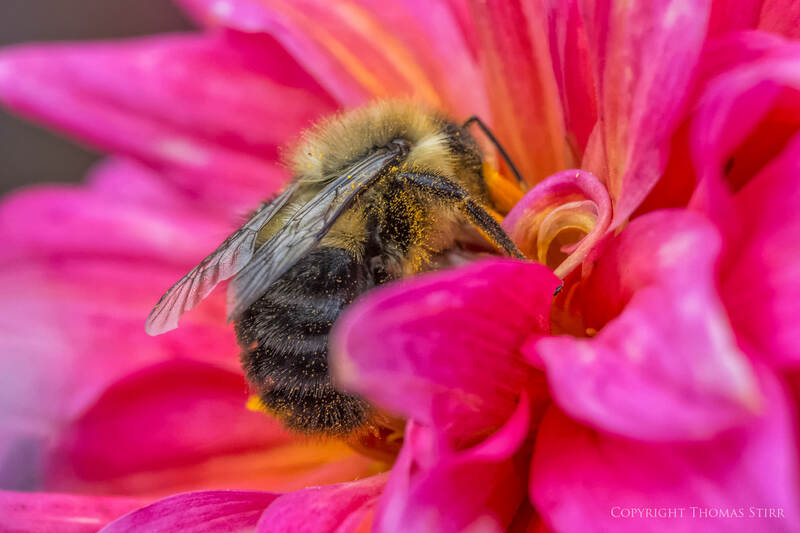 Obviously using only one extension tube at a time cuts down the magnification effect but also allows you to shoot with the camera further away from the subject, but even with just the 10mm extension tube alone you’ll still be about 2″ (5 cm) away from your subject for maximum effect. The focusing distance with the 10-30 using extension tubes appears to be 1″ to 6″ (2.5 to 15 cm) range depending on which tube or combination of tubes is used. The FT-1 adapter will work and auto focus with 50mm G is fully operational (I have that lens so I could do some exact test shots for you). The size of the subject in my test went from approximately 1.8 cm to 7.5 cm, or about 415%. To achieve this the front of the lens was approximately 5″ (12.7 cm) from the subject. You’ll need to be careful when trying to use the FT-1 adapter with these Vello extension tubes as mounting a lens to the FT-1 takes a fair amount of torque. If you don’t brace the FT-1 and your F-mount lens that torque could be transferred down to the extension tubes and damage them. While this set-up does work, it does feel quite loose and wobbly. 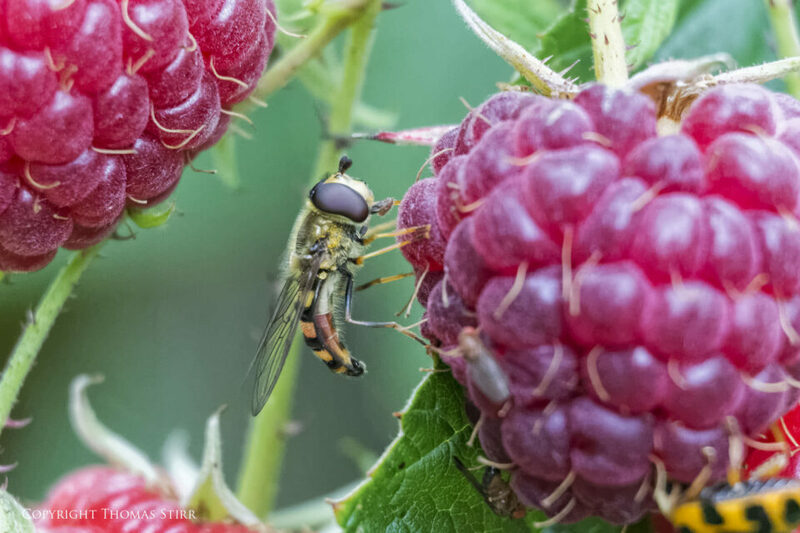 As far as achieving more than a 1:1 magnification with a potential 1 Nikon macro lens that will depend on what the minimum focusing distance is with such a lens. 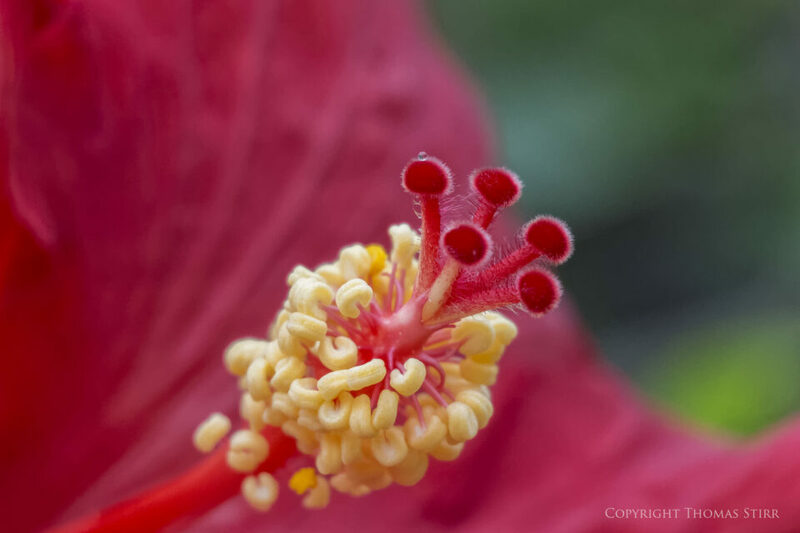 If it focuses very close to subjects an extension tube may not allow the lens to focus. Excellent review. 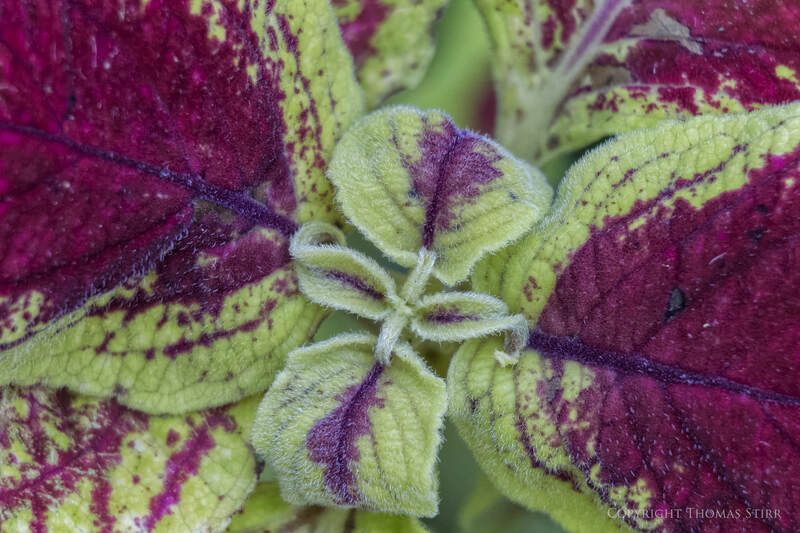 I picked up a set of inexpensive Kodak 40.5 mm closeup lenses this summer and had fun using them. However, there was a definite loss of optical quality compared to the extension tubes you used. The only downside of your review is the demand you generated – B&H is currently out of stock! Wow…I had no idea about the stock situation at B&H! Glad you enjoyed the review! I am so happy I found this article of yours Thomas! 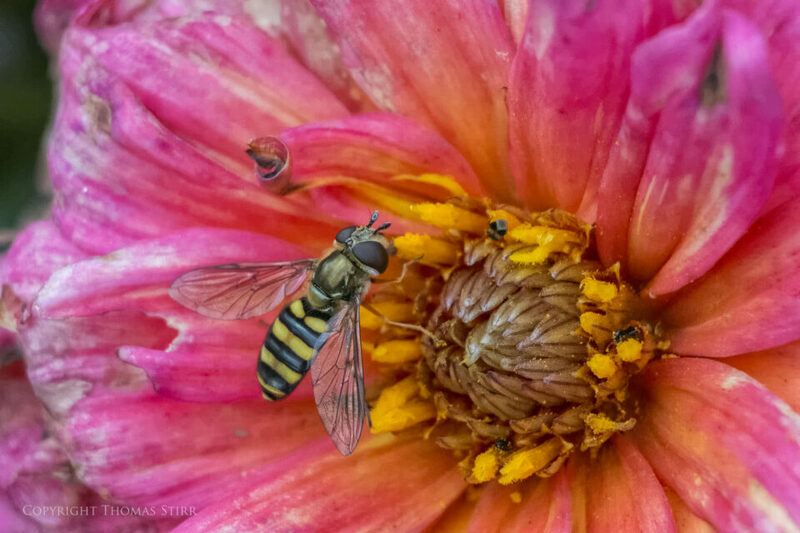 I love taking close up photos of flowers and bugs with my Nikon V1 camera! I LOVE your photos and am totally amazed that you could be such lovely images at ISO-1600 and ISO-3200 and hand-held. Did you shoot most of these at 30 or 110 or somewhere in between? I have the 30-110 lens too and use it with the Vivitar Close-Up Macro Lenses, but I don’t seem to get as many as sharply focused as you. Could you give me more tips about how you hold the camera so steady and any extra tip on focusing would be nice too. I don’t have a tripod at this time and have to handhold all my shots. All of the shots were done hand-held with the 1 Nikon 30-110mm lens fully extended to 110mm (efov 297mm). If you check the shooting details on each image you’ll see that the shutter speeds I used were between 1/100 and 1/640 so they were not really all that slow. I used single point auto focus for the majority of the images to ensure that I could get my focus point exactly where I wanted it. I used the lens softness and PRIME noise reduction functions in DxO OpticsPro 9 on each of the images to help with image sharpness and to deal with noise issues at ISO-1600 and ISO-3200. Nothing really special about my hand-holding technique…elbows tucked in, good solid stance or body posture, shutter release at the end of full breath exhale, with a slow, smooth press on the shutter. Thank you so much for informing us about this extension tube set. I purchased the set and am quite pleased with it. I am sure it will add to my enjoyment of photography. In fact, it already has. Here is an image I shot yesterday of a half inch long Ivy Geranium bud. The picture was sh0t handheld, so it would have been better if I had used a tripod. I don’t claim professional results but they sure are good enough for me. Very nice capture! I’m very pleased to read that you are enjoying the extension tubes! At the very onset let me compliment you for a great write-up. New to the Mirrorless camera thing. As a matter of fact I am new to the whole Nikon system. Moving from Panasonic Lumix DMC FZ50. I love shooting architecture, CITYSCAPE. SKYLINES and such. Occasionally would love doing portraits of small children, old couple et al. Was recently gifted Nikon J1 with kit lens 10-30 MM f/3.5-5.6 PD Zoom. Given my requirements what other gears should I add to my list. Your suggestion will be greatly appreciated. Also I keep reading that Extension tubes have potential of ruining the camera, how true is that? And will I need one for my type of photography. If so kindly suggest one. In terms of cityscape, skylines and such you may want to consider the 1 Nikkor 6.7-13 mm f/3.5-5.6 zoom lens. It is quite sharp and will provide you with the equivalent field-of-view of 18-35 mm when compared to a full frame lens. The 1 Nikkor 32 mm f/1.2 is a beautiful lens which is very good for portraits, but also is one of the most expensive in the Nikon 1 lineup so it may be difficult to justify in terms of the investment required. If you like the Nikon 1 format you may want to consider a Nikon 1 J5. It features a 20.8 MP BSI sensor with much better dynamic range and colour depth than any other Nikon 1 camera. It also has a tilting rear screen and better ergonomics. I have three of these bodies and use them for all of my photography when I don’t need an EVF equipped camera (the J5 like your J1 does not have an EVF). In terms of extension tubes, I’ve been using them for quite a few years now without any adverse effects thus far. I would avoid any tubes that have plastic mounts as the flanges can crack making the assembly unstable. I’d suggest the Vello Delux Extension tubes for Nikon 1 which were available from B&H in the past. I have a set of these tubes and use them frequently. I also have a set of MOVO tubes. I’ve heard from many Nikon 1 users who are planning on keeping their system for as long as possible. Many are looking for new or good used gear to supplement their current kit so finding additional Nikon 1 bodies and lenses, even used ones, can be a challenge. Thank you for your prompt input. Truly appreciated. In one of your articles you mentioned Vello Deluxe to be extremely fragile so do you still recommend it.? Could you please give me your opinion on this one : Kooka KK-NM47AF it is listed on ebay for about $69. The Vello Delux Extension Tubes for Nikon 1 have metal mounts and are far more durable than the plastic mount version. I have no trouble recommending the Vello Delux tubes. 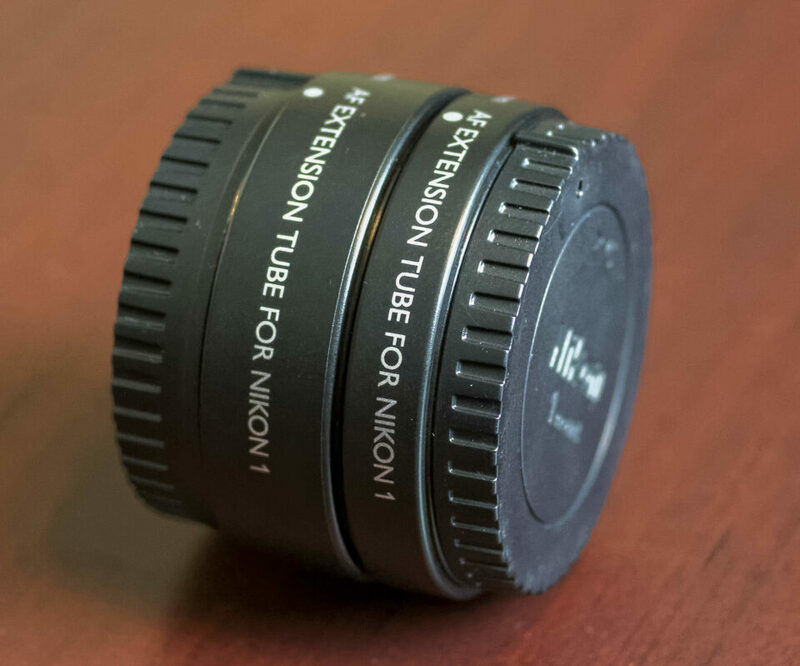 What is your take on Kooka KK-NM47AF extension tube for Nikon 1? Given your updates on how fragile the plasticky Vello Deluxe proved to be, I was considering these since I was unable to find Movo anywhere online. (I would appreciate if you coughs provide me with a link to Movo). I have never used this brand of extension tubes so I can’t comment on them from personal experience. They do seem to have either metal mounts or metal coated plastic mounts, both of which should be more durable than plastic mounts. Since, the Vello Deluxe were really hard to come by, I just ordered for 2 sets Movo also got a great deal on Nikon 1 S1 and a Brand New J5 with 10-30 PD Zoom Kit lens. So now per your recommendation I shall have 2 J5’s and a S1 for back up. Btw the S1 came with 11-27.5 mm (I would appreciate your honest take on both the S1 and the 11-27.5 and the 10-30 PD ZOOM) also I want to know your take on Nikon FT-1 adaptor. Given the Nikon 1 system has limited lenses to choose from, do you think I should invest in adaptor? Does it alter the IQ in anyway? Hoping to hear from at your earliest convenience. I’ve never used the 1 Nikkor 11-27.5 mm lens so I cannot comment on it. That lens does not have vibration reduction so I never had any interest in it. We owned an S1 for a very short time. It was purchased for my wife and after using it for a little while she didn’t like the fact that the camera did not have an EVF. She also found the rear screen was quite difficult to use in bright sunlight, so after returning from a trip to Greece we sold the camera shortly thereafter. I never much liked the S1 either as I didn’t like the handling of the camera, as there were not a sufficient number of external body controls for my liking. Whether one person likes a camera or not is really a moot point. It all comes down to what the owner of the camera wants and needs. You may find you like the S1. As far as the FT-1 adaptor goes, it really depends on whether you already have a selection of F-Mount lenses. If you do, then having the FT-1 adaptor would extend the use of those lenses to your Nikon 1 kit. I suppose having an FT-1 adaptor would provide you with some additional flexibility should you have trouble finding more 1 Nikkor lenses for your kit. I really can’t tell you what you should, or shouldn’t do, as it depends on your personal needs and how much money you are willing to invest in a discontinued system.